Sleep Apnoea is obstructed breathing during sleep: the inability of air to pass through the nose and mouth opening during sleep from the narrowing of the upper throat passageways via soft tissue collapse. People who suffer from sleep apnoea are at risk for a number of more serious health problems. The following risk factors have been identified with sleep apnoea: hypertension, diabetes, heart disease, driving and work related accidents as well as stroke. Treatment by a sleep physician usually starts with a Continuous Positive Airway Pressure machine. However, if this is not well tolerated, the next option to help relieve this inability to breathe properly during sleep is through the use of a Mandibular Advancement Splint. 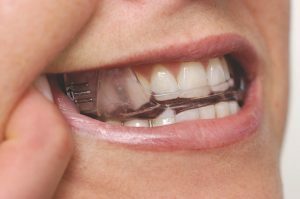 This device is used in the mouth during sleep to help hold the lower jaw in a forward position; consequently the associated soft tissues are in a position where airflow is free and obstruction is relieved. A referral from your sleep specialist or general physician is required prior to consultation and fabrication of a Mandibular Advancement Splint. Dr Michelle Ever Juan is trained and experienced in the provision of these devices. She utilises Somnodent MAS, which is the most researched and clinically validated device for continuous open airway therapy.